Enjoy the beauty of Lake Tahoe year round. 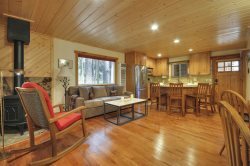 Just minutes from your North Lake Tahoe vacation rental, you'll find countless outdoor adventures, incredible local dining and activities your whole family will love. Start planning your next Tahoe getaway below! It`s not just the humans that have fun in Lake Tahoe! In fact, the dogs might be having even more fun. We understand that your dog is also a part of your family and have provided a multitude of dog friendly beaches, parks and restaurants to include your dog in that memorable family trip to Tahoe. All of the fun isn`t had by the outdoor enthusiasts. Shopping in Lake Tahoe is a great way to explore Lake Tahoe`s local charm. Truckee, Tahoe City and the resorts display local artists and commercial merchandise alike. Whether you are looking for new designer names, or that special unique Tahoe gift, the shops in North Lake Tahoe are sure to have what you are looking for. Summer time in Lake Tahoe is not only one of the most beautiful scenes, but also one of the most fun. These mountains are not only for skiers, but for the summer lover as well. The huge variety of summer activities make for an amazing and memorable vacation. Fun winter activities don`t end with skiing and snowboarding. The shore of Lake Tahoe provides endless hours of winter fun! You may just want to pick up some rental equipment for snow shoeing or cross country skiing and create your own adventure, or you can join in on the numerous tours and guided events throughout the North Shore. And don`t think the local resorts are only for downhill athletes, many of them provide a wide variety of amenities such as ice skating, tubing and dog sled rides.